Baltimore, Maryland (February 12, 2013) — Elliott Affiliates Ltd., the industry leader in advanced solutions for developing and managing custom cleaning programs and contracts, is pleased to announce the launch of Spec Optimizer, a new software suite that will help building managers achieve a higher quality clean at a potentially lower cost. Launched at the National Facilities Management and Technology Conference in Baltimore, Md., the new software suite offers an easy-to-use tool that allows building managers to develop customized specifications for cleaning RFPs. 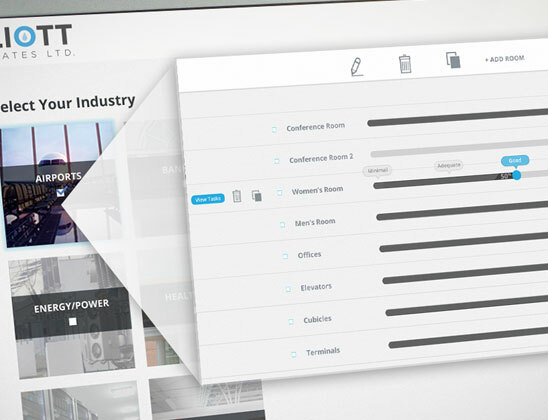 Launching formally at the NFMT show on March 4, Spec Optimizer is free to use with hundreds of options for users to quickly optimize task and frequency specifications with a simple to use web application. By using the software’s advanced slider concept, users can do away with arduous spreadsheets and instantly create and select between Task-Based or Performance-Based specifications. The Spec Optimizer empowers managers to determine what specific areas and task are most important, somewhat important and less important, in achieving a consistent cleanliness goal. This optimizing approach focuses on results and creates a clear definition of strategic, tactical and operational goals, and assures alignment at all levels of the buyer and contractor organizations. “No longer will building managers be forced to choose between quality cleaning services and affordability. With Spec Optimizer, they can create the perfect balance in a fast and simple tool,” says Vince Elliott, President and CEO of Elliott Affiliates Ltd.
Too often, cleaning contracts are not given a significant amount of time and thought, generally resulting in a lower level of quality at a potentially higher cost. Spec Optimizer reverses that by making it easy for building managers to develop a customized cleaning program, ensuring that they get a higher quality in areas that need it most. A customized cleaning program helps facilities proactively manage their cleaning budget, potentially resulting in significant savings. With more than 40 years of experience, Elliott Affiliates has pioneered performance-based cleaning methodology, and can assist in optimizing cleaning programs at a lower cost.